The game of soccer is constantly in flux; new ideas, philosophies and tactics mould the present and shape the future. Since the turn of the century we have witnessed dramatic changes in the beautiful game: new types of player, new coaching methods and tactical innovations have all enhanced and changed the sport of football. The technical, tactical, physical and psychological skills needs of the modern player – from the goalkeeper to centre forward – have all been enhanced. In a nutshell, the modern game is quicker as well as being technically and tactically more advanced than for previous generations. Excitingly, the future promises to be even faster, more technical, and more demanding of its players! After witnessing Spanish football and Barcelona provide one of the great periods of global dominance – we are now entering a new era; one which is being led by German football, and notably Bayern Munich. Germany, now world champions at international level, along with the visionary coaching philosophy of Pep Guardiola at club level, are taking football into a new epoch, one which the Italian coach Arrigo Sacchi prophesised several years ago. One of Universality. In this book, Matthew Whitehouse – acclaimed author of The Way Forward: Solutions to England’s Football Failings – looks in-depth at the past decade of the game, taking the reader on a journey into football’s evolution. Examining the key changes that have occurred since the turn of the century, right up to the present, the book looks at the evolution of tactics, coaching, position-specific play and -of course – Pep Guardiola. They have led us to this moment: to the rise of universality. 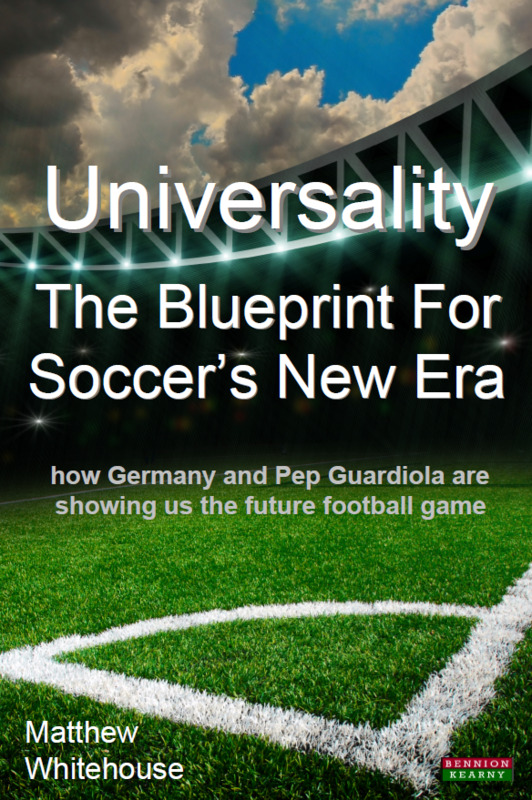 Universality | The Blueprint For Soccer’s New Era is a voyage into football, as well as a lesson for coaches, players and fans who seek to know and anticipate where the game of the future is heading. Book Categories: Soccer, Soccer Coaching Books and Sport.